Roger Federer is dominating tennis in a way all other athletes would envy, but most advertisers and Americans don't know who he is. NEW YORK (CNNMoney.com) -- Roger Federer is probably the most dominant athlete active today, yet there are two places he hasn't been able to win -- the French Open and Madison Avenue. The former is understandable. The clay courts of Roland Garros make tennis there almost a different sport from contests on other surfaces. And Federer probably would have a couple of French Open titles under his belt to go with all his other majors if he wasn't always running into Rafael Nadal, who is as dominant on clay as Federer is on other surfaces. Tennis superstar Roger Federer has had trouble breaking through with advertisers, although his upcoming spots for Gillette could help to change that. His inability to win on Madison Avenue? That's much tougher to understand. "It's pretty much a mystery to me," said Bob Dorfman, an endorsement expert and editor of the Sports Marketers Scouting Report news letter. "I could probably walk down the street, he could walk by and I don't know if I would notice him." Even though Federer lists Nike (Charts, Fortune 500), Rolex and Wilson Sporting Goods among his sponsors, he's yet to appear in a national television ad campaign in the United States. He's a good looking guy (he made People magazine's list of sexiest people), is well spoken (He's Swiss, and his English has only the hint of an accent) and has a gold-plated reputation as genuinely nice person. And on the court, he's as dominant as can be imagined. Outside of the French Open, it's news when he loses a set, let alone a match. He's the overwhelming favorite to win his fifth straight Wimbledon title in this year's tournament, which is currently underway, as well as his fourth straight U.S. Open this September. He's already won his second straight Australian Open title. His chances of someday overtaking the record for most majors in his sport from Pete Sampras are arguably greater than his pal Tiger Woods' quest for the same record in golf. And for all the talk about how Americans love the underdog, the truth is that U.S. sports fans, and especially advertisers, love dominant champions more than anything else. Federer perfectly fits that bill. Yet surveys conducted by talent agency Davie Brown and Marketing Evaluations, which does the Q score ratings used by potential advertisers when considering which celebrities to use in their spots, say that he's only known by about 22 to 27 percent of Americans surveyed, far less than the top female players in his sport, such as the Williams sisters and Maria Sharapova. He even has less than half the recognition of Anna Kournikova, who has a new endorsement deal and a national commercial with K-Swiss (Charts), even though she's no longer playing competitively, and was never all that competitive when she was playing. "The biggest detriment (to Federer's endorsements) is really the visibility and exposure of tennis, at least on the men's side," said Scott Sanford, senior director of talent at Davie Brown. "The lack of American talent on the men's side has a negative effect on his domestic visibility and marketability. He's picked the wrong time to be dominating." 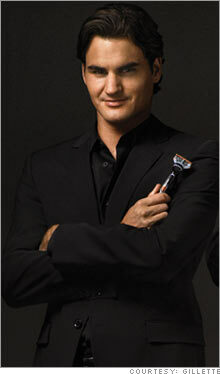 Another part of the problem has been that Federer hasn't really sought big endorsement deals in the past. One of the things that athletes from LeBron James to Peyton Manning to Tiger Woods have all discovered is that being in high profile ad campaigns helps to bring more high profile ad campaigns. "He's got the lowest negatives of any tennis player right now, next to Chris Evert," said Henry Schafer of Marketing Evaluations. "He's in a decent position for growth if someone steps up to take advantage of him." That's why it's possible the most important break through Federer might make with sponsors this year isn't another major title or three, but his first set of U.S. national ads, set to start airing later this summer, for Procter & Gamble (Charts, Fortune 500) unit Gillette. He'll be appearing with Woods and European soccer star Thierry Henry in the razor maker's new Gillette Champions global ad campaign. "From our standpoint, he fits perfectly in the campaign," said Gillette spokesman Mike Norton. "From an icon point of view, he fits nicely in the male grooming category." Being in spots with Woods can only help Federer, especially if it stirs up talk about which of the two is more dominating, and if the spots show some interplay between him and his famous pal. Federer joked at the Gillette press conference that Woods has an easier time competing than he does "because he always plays on grass." But Thierry Henry is so unknown to U.S. sports fans that he probably makes Federer look like Paris Hilton in terms of name recognition. So the risk for Federer is that the ads could come across as "Tiger and those two guys I don't know," even in the eyes of many big sports fans, let alone casual fans. Still, getting any exposure has to be considered a good thing for sports' most anonymous super star. And it might be something that some future sponsors can take advantage of. "He certainly would have been perfect for the old American Express "Do you know me? campaign," said Dorfman. "Maybe some sponsor can play off of that angle, the greatest athlete that nobody knows, and maybe the product he's selling can help him become more recognizable."